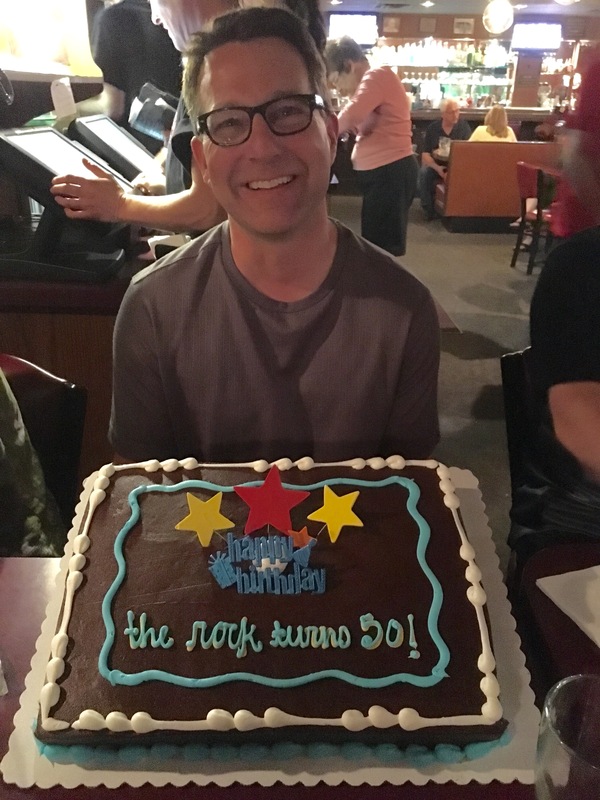 The hubs celebrates a big birthday this month. As our children like to tell him, he’s halfway to one hundred. Whoa! It seems so weird to think about how I married a 29-year-old and that in the blink of eyes that now require reading glasses I’m married to a 50-year-old. Same guy, different number. He’s cool with it. Cause he’s just cool. But those numbers can rattle my insecurity as if a number is what defines me. I remember when I was turning 40 and was wringing my hands about that number and what I imagined it stood for. Middle age. Wrinkle cream. Becoming suddenly unsure of my wardrobe because the forties occupy this middle space, a life stage limbo when some clothes make women look like they’re trying too hard–rhinestone studded denim and leopard prints, or like they’re simply giving up–rhinestone studded sweatshirts and elastic waist capris. THAT, my friends, stuck with me. A message born of wisdom. This train isn’t slowing and it will most certainly stop one day. If we’re lucky and live to be 80, we surely don’t want to have wasted being 40 by being obsessed with the number. We’re in awe at the 60-year-old who runs a marathon but people in their forties receive a collective shrug. Why is no one impressed with my ability to work an iPhone or decipher my health insurance coverage? My BMI and cholesterol levels are within the acceptable range and I have relatively few aches and pains. Isn’t that impressive at my age? But still, I struggle with insecurity. I rant about photo-shopped celebrities and the ubiquitous use of cosmetic treatments and procedures. I occasionally hover weirdly close to the TV screen leaning in to examine a newscaster’s face for a frozen furrow or overly plumped laugh lines. I wish for more women my age to just let those lines live on their foreheads so I’d fit in and feel better about myself. I seek solace by wanting to compete on my own terms. I’m a fool. Because it’s not a competition. It should not and does not matter how we look compared to other women because our beauty and our worth are not measured by how we look in contrast to others. We know this but how do we live it? Aging women like me who’ve been tricked by society into over-emphasizing youth and beauty as currency might want to figure out what else we’re good at in order to avoid the losing game of chasing what we maybe never really had and certainly can never get back. Cosmetic treatments might help some of us look “better”, but in truth, they don’t really make anyone younger. And the maintenance. Gah! It’s endless. I can see why grandmas used to just let those chin whiskers grow and their hair turn grey. Trying to meet media standards of beauty is just SO MUCH work. Okay fine. Yes. I will continue to tweeze those chin whiskers. And my hairdresser need not fear losing me as a regular client just yet. But I’m going to try to be cool like the hubs and live less in fear of my number. I’m going to focus on what other currency I might have to share. Wisdom? Encouragement? One need not be young or beautiful to be a good mom, wife, friend, reader, writer, thinker with a daily goal to live a useful life. As the present owner of 58, I would prefer your not nosing in (making me look bad!) And here’s what I think, for what it’s worth, is your “currency,” my dear friend: an open, inquisitive mind; some serious smarts; honesty; strong sense of family and purpose. Remarkably “valuable,” all in all. Happy birthday to your hubby. LOL! You always make me smile. I’m so glad to know you. Truly. Liked your post very much! I too have a 50 year old hubby!